I could probably just copy and paste the words I wrote about Garth Brooks’ breakthrough album No Fences here as a year later very little has changed. The focus is still on good ol’ country fun on the likes of Rodeo, which features some of the most predictable lyrics I’ve heard in pretty much any country song. We Bury The Hatchet seems to do so while a line dance is going on, while opener Against The Grain is so frantic with it’s banjo that it sounds like Brooks is being chased across a canyon while it’s playing. Papa Loved Mama is so country that it physically hurts and is far too honky-tonk for a song where ‘Papa’ gets locked up for killing ‘Mama’. 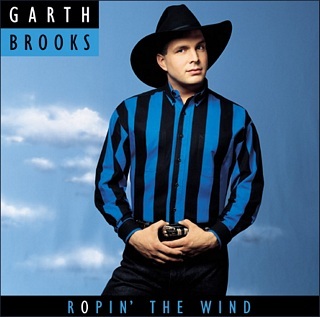 I found it interesting to see that Brooks himself wrote a much bigger portion of the songs on Ropin’ The Wind than he did on No Fences, which might go a long way to explain why the songwriting has taken a fair dip. It’s of not that standouts like What She’s Doing Now and Cold Shoulder are ballads, where things are much less hectic and much less dramatic than the equivalent from his last record. Ropin’ The Wind sort of just happens and sounds just as dated as No Fences did, but with worse songs. Garth Brooks is literally the biggest selling solo act in US chart history and I’m yet to listen to an album of his that explains why more than simply ‘Americans love a good ol’ upstandin’ cowboy country singer’. On Ropin’ The Wind he’s barely even that. Best Track: I guess I’d go with What She’s Doing Now if I had to choose. Tags: Country, Garth Brooks, Ropin' The Wind, The World's Greatest Hits, What She's Doing Now. Bookmark the permalink.